Governor Terry Branstad, at his Monday morning news conference. 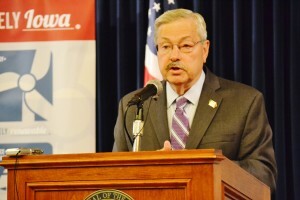 Governor Terry Branstad has formed a non-profit group to raise at least $1.5 million for a “family-friendly” National Governors Association meeting in Des Moines next summer. An evening at the statehouse is planned, plus a reception at Terrace Hill, the governor’s mansion in Des Moines. There will also be activities planned on the state fairgrounds. Then-Governor Tom Vilsack hosted the nation’s governors in Des Moines in 2005. REO Speedwagon played a concert for the group on the fairgrounds, although Vilsack had hoped to land ZZ Top — his favorite band — for the event. Branstad’s not saying what entertainment he’s aiming to book for the 2016 meeting. The bipartisan National Governors Association holds a meeting each summer. Branstad has only missed one in the 21 years he’s been governor. Branstad took his children and grandchildren to this summer’s National Governors Association meeting in West Virginia last month.